You must make reservations at least 5 minutes in advance of the time at George Trois. We offer Valet Service Wednesday through Sunday for $8. There is also Street Parking on Green Bay Rd. or in the commuter lot. George Trois is part of The George Trois Group, offering three distinct restaurants at one address: Aboyer, Silencieux and George Trois. All reservations must be made with a $40 per guest, non-refundable deposit 24 hours in advance of dining. Book your George Trois experience by calling directly. (847) 562-6105. 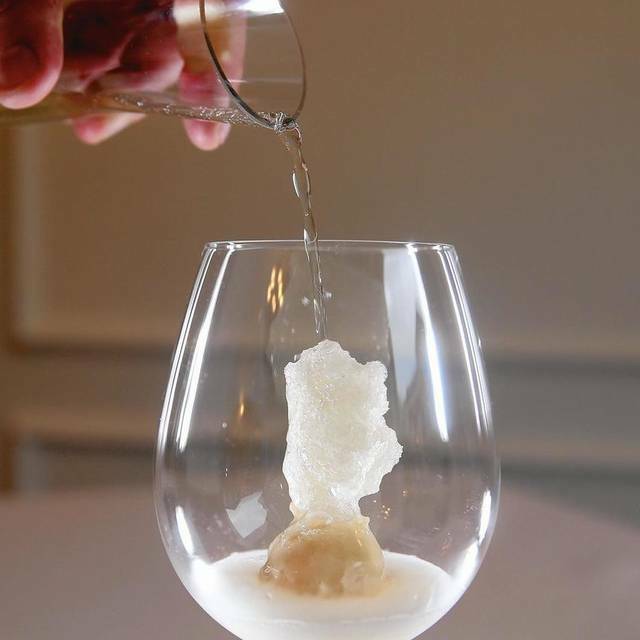 Your experience at George Trois will be a 12 course, chef designed, tasting menu. The cost is $205 per guest. Any additional beverage service, including wine flight and selections from the list, are an additional charge. Every course was delicious, attractive to see, and creative. The flow and rhythm of flavor intensity, plate weight, texture was like a gentle warm wave... of pleasure. Service was impeccable and gracious. Room was cozy yet elegant and intimate. We will be back as soon as they reopen. I expect a second Michelin Star is not far behind. We were so impressed on our first visit to George Trois last Friday evening! 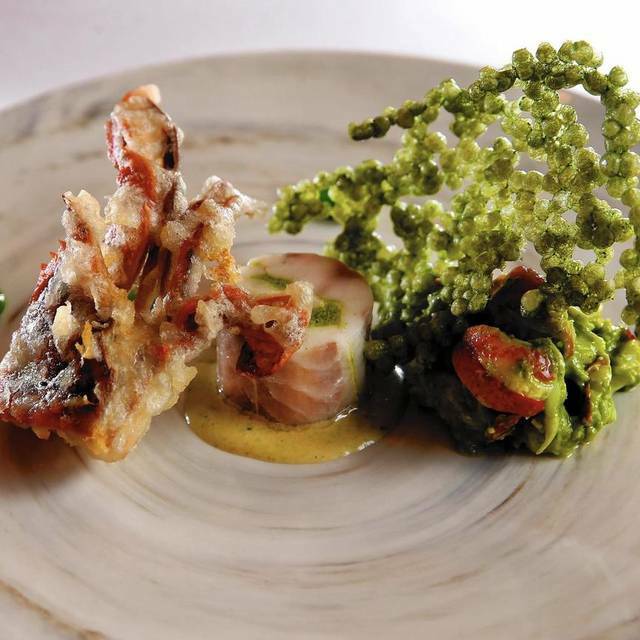 Chef Michael has elevated his amazing cuisine to its ultimate level of taste, presentation, and elegance. The inspiration for each dish was mesmerizing and memorable, and Chef Michael's personal attention in presenting each course provided a most captivating dining experience. The service was elegant and perfectly timed, and we highly recommend the premium wine flight which was the perfect complement to the various courses of the menu. The ambiance was intimate, elegant, and tasteful. Congratulations to Chef Michael and his gracious team for creating and executing one of the most memorable evenings in the Chicago restaurant scene. This is my new FAVORITE restaurant. Atmosphere, food, service were all amazing!!!! I can't wait to go back. Lived up to it’s “best restaurant” rating. Perfect for special date night. This is one of the best restaurants on the North shore. The food is exquisite, great ambiance and amazing service! Very elegant! Many thanks to chef George who made our evening of one the best ever! Far beyond our expectations. Each serving was unique, delicious, and well presented. Ambiance is cozy and friendly. Can’t wait to do it again. Fabulous meal in a quiet, lovely room. If you like old school French, this place does it at the highest level. An outstanding 12-course meal, with each course presented by the chef, who is friendly and accessible. A small, white room (5 tables) inside Restaurant Michael makes for quiet focus on conversation and the food. The courses were all delicious, though for us the weakest was dessert ... hated to end on a soft note! Everything else was excellent though. Staff is efficient and friendly, and not pretentious. However, this is one pricey meal (which doesn't include tip). My husband and I celebrated our 35th wedding anniversary at George Trois. It was one of the best dining experiences we've had. We greatly enjoyed celebrating our anniversary at George Trois. Our expectations were high, and those expectations were exceeded. The ambiance, knowledgeable service, quality and creativity of the food, and personal attention made the evening special. After being seated in a private room separate from the main dining area at Restaurant Michael (which is co-located with George Trois), you are welcomed by Alfredo and Chef Michael and given an introduction to what the evening will include. Twelve courses unique to George Trois are prepared and presented at a comfortable pace, served with excellent wine pairings (three levels available) if you choose. 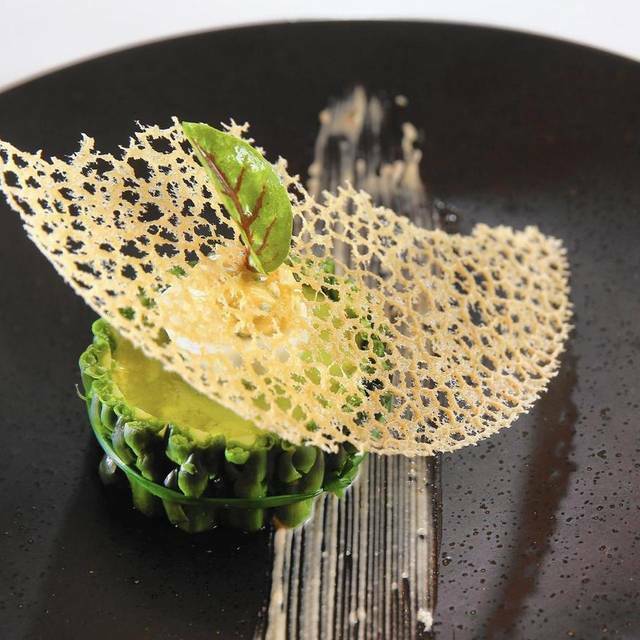 Courses vary with season and the chef's inspirations. Everything we had was elegantly presented and tasted wonderful. Flavors were well balanced. 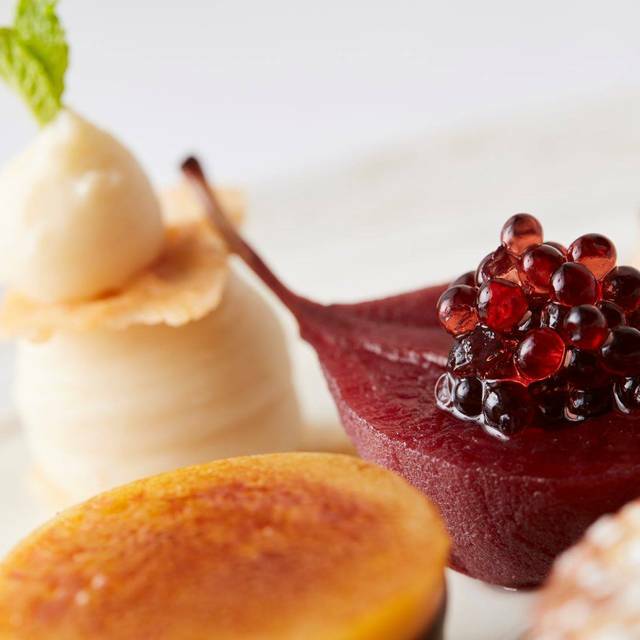 This is truly a extraordinary dining experience suited to special occasions, special friends, and those who enjoy first-class French food and world-class service. What a beautiful evening we had. Our second visit and we plan for a third. Chef Michael's experience, passion and culinary creativity and playfulness are poured and placed in front of you as he delivers and describes each dish nearly poetically. The intimate room of six tables allows for quiet conversation and intimacy, yet accomodates laughter and comraderie. Don't want to ruin the surprise of what the menu entails, so here's a few spoilers. A hot buttered rum cider arrives after you are seated. On a cold November night, it instantly warms and welcomes you. 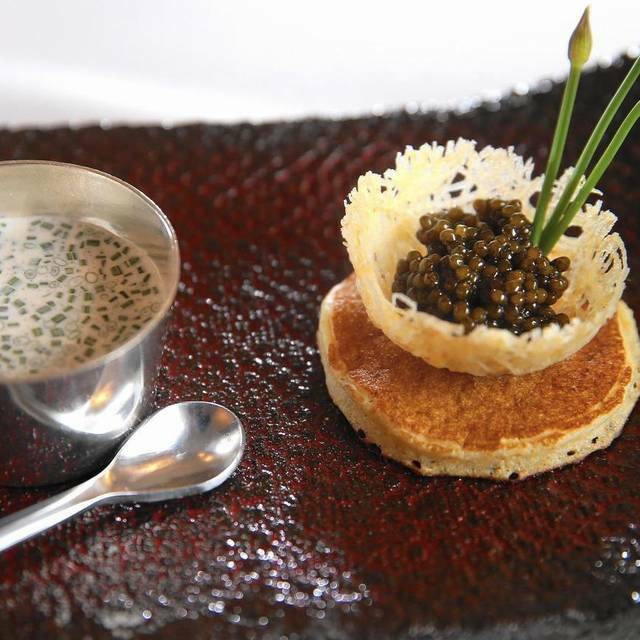 From there, chestnut soup (with a foie gras cracker that we shall not forget), caviar with another notable cracker, duck (and it's the only duck I'd ever request again), chicken, halibut, delightful palate cleanser, lamb that must be worshiped. There is a huckleberry/lamb side dish that I've requested as a component of my last meal, an unusual cheese course that I'd love to replicate, and then dessert, dessert and more dessert. We opted for the wine pairings which Sergio, GM/sommelier, pours with a good nature, a story if you like, and a beaming smile. There are several choices for the pairings for all budgets and livers. This was a flawless night. Have not ceased thinking about how well we were taken care of from arrival to hugs good by, to the gasps when each item was placed in front of us, to the sighs as we began to taste. This is a very special and not to be missed gem. 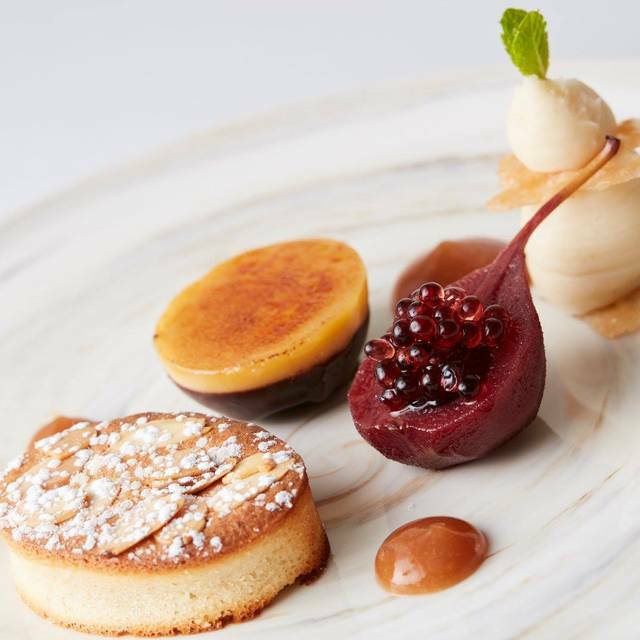 Our Christmas wish is to have the good fortune to sit in Chef Michael's kitchen to watch and learn how to compose any of these masterful, delicious and stunning courses. But we'll settle for a return visit, knowing the next time will (hard to imagine) be even better and leave us wanting to return yet again. It's rare to see a Chef's heart and soul present itself as you do here as you have the good fortune to interact with him throughout the evening and it makes the experience that much deeper and eye opening. To celebrate My husband’s birthday, I took him to a four-hour, 12-course prix fixe dinner at George Trois in Winnetka. It is in a separate room in the same building as Michael’s. There are only six tables in this private room, and Chef Michael Lachowicz personally served every course (with an appropriate and interesting explanation) at each of the six tables. It is classic French dining. Service: Pedestrian - We've had better service at virtually every mid-price restaurant in Chicagoland we've ever visited. Food: Pedestrian - We've had a lot of fine dining meals over the years throughout Chicago and elsewhere in the world. As far as I am concerned, every single dish here could have been prepared by a non-professional home cook at least as well and, for one course, it actually entered my mind that I was in an episode of Children's Chopped that had gone seriously awry. Wine: Pedestrian - The flights menu had no details, just prices. We avoid flights anymore because they are usually comprised of uninspired wines with maybe one that is a wonderful surprise. I asked for some guidance on a Burgundy in the $250 range and after a chat with the server I accepted his recommendation and as he was walking away he told me that the wine I selected was one that was drinking very well on their wine flights. Ugh! I was right. The wine was...you guessed it, pedestrian. Price: Offensive - For the food and experience we had, $190 per person was appalling. Our total bill for this meal was not exceptionally high relative to what we typically pay for fine dining but the value was simply terrible. It was so bad that once we reached the sidewalk after the meal we both laughed and said "So. Oriole next week for a meal where the food is actually good?" Delicious food. Great service. Excellent experience. Special occasion and appreciated the time, attention and explanation of each course by Chef Michael! 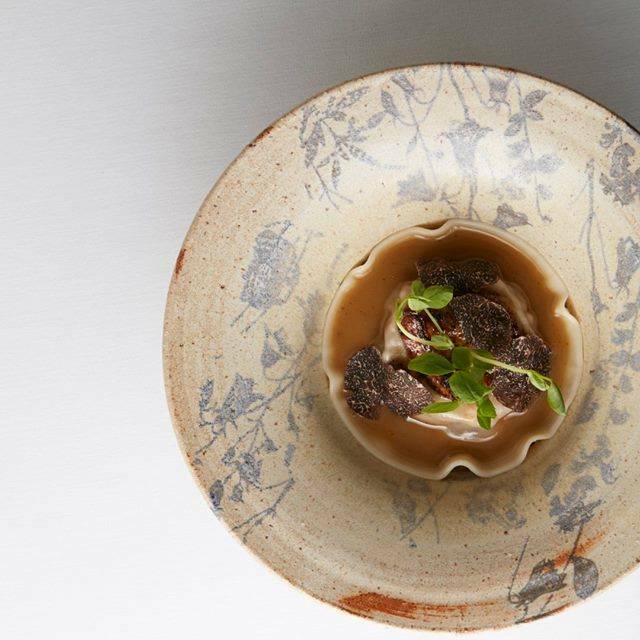 9-courses exceeded expectations with caviar, foie gras, Dover sole and lamb as stand-outs with truffles incorporated into many dishes thoughtfully presented in a "matching" serving vessel. Beautiful all-white room with limited 5 tables and extremely attentive service. Did not feel the wine pairings - 4 for $116 - met expectations, so would forego next time. Thanks for the lovely evening! As always, George Trois is an experience that defies ordinary vocabulary. The food is thoughtful and creative. The presentation extraordi9nary. Michael is your constant companion, gastronomic educator and your friend. Menu items were creative, well prepared, and flavorful. Service was perfect as was the presentation of each item. I highly recommend this location! From start to finish Chef Michael made my birthday and the dinner for 12 close friends spectacular. Sergio’s wine pairings were superb. I cannot wait to return to George Trois!! Outstanding! Food, wine, service and ambiance all at the highest level. A truly special experience. This was one of the best meals we have had in Chicago. The decor in the small room adjacent to Restaurant Michael was very comfortable. The personal engagement of Chef Michael made the event like eating in his home. The flavors were outstanding. The wine pairings were very good, though a bit pricey. We have already scheduled a return visit for our anniversary. rich flavors but not heavy! Fantastic food ... had no idea that this level of gourmet food is even available on the North Shore. Michael and the team made our anniversary a very special experience- highly recommended! Each dish was very complex, and beautifully presented. The chef served each dish and explained everything in it. Every dish was excellent. We had a memorable dinner, and had a take-home goodie and the evening's menu too. The food was excellent - not so contemporary that you don't know what you are eating. Every bite was delicious. And with some of the dishes - just the aroma is sufficient to win you over. Chef Michael is a genius! Each course was more delicious than the last and really fun. It’s always a great experience with him but his imagination sores at George Trois. I cannot wait to go back! The intimate atmosphere, discreet and attentive service coupled with Chef Michael’s creative cuisine made for a perfect dinner. Wow! All I can say is Wow! Four of us had a wonderful, memorable dinner at George Trois on Saturday. The service was great. It was delightful to have the Chef explain each course. He was engaging and interesting. Overall a very nice evening. Pricey but worth it for a special occasion. It was an incredible dining experience! The food was absolutely perfect. The finest ingredients perfectly prepared and beautifully presented by none other than Chef Michael himself. We felt like we had been invited to dinner at his home. The service was very attentive, knowledgeable and friendly. We couldn't decide on a favorite course because they were all delicious. All in all it was one of the best dining experiences we have ever had and we eagerly look forward to our next visit. Overall the savory dishes were great (minus the fondue). The ravioli was define. The burre rouge was amazing with the beef. The delicate potatoes on the fish was amazing. The savory dishes were really on point. There were a few dishes that weren’t as successful. The fondue opening was too small to dip and it wasn’t that good. The sweets also need further refinement. The best dessert was the banana bread pistachio. The macron,chocolate truffle combo wasn’t as good. The soufflé didn’t need the addition of truffle. Overall this was a great meal. With further refinement of the sweets, the meal would of been even better. It is an amazing and memorable experience. The service is first class, along with the wine list. The fine setting, friendly staff, and great food make it a highly recommended. George Trois was a wonderful dining experience. Each of the tasting menu courses was creative and delicious. We will definitely return. Simply fantastic. 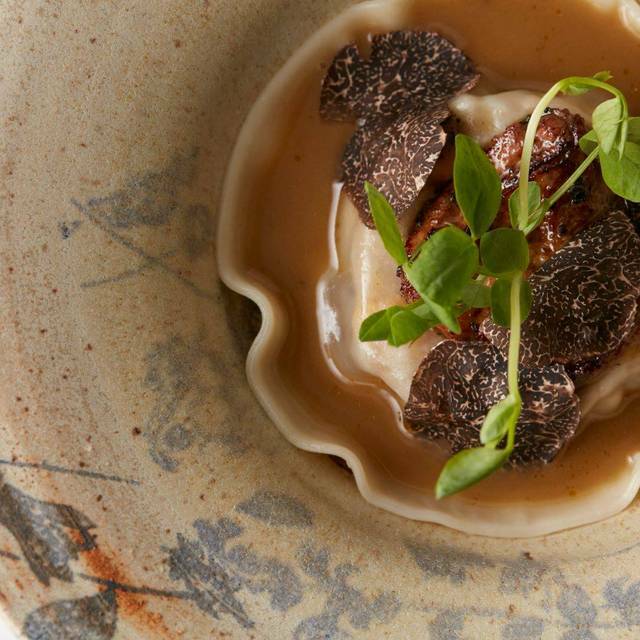 The truffle menu was creative, presented beautifully, and delivered a range of flavors and textures. The wine pairings were spot on. Chef Michael personally served and introduced every course (9, I think? ), and his love and enthusiasm for the cuisine was evident. The service was impeccable, and the banter with staff was good humored, witty and fun - Daniel is an excellent foil for Michael. This is not a cheap date night, however you absolutely get what you pay for. We highly recommend, and will be back.